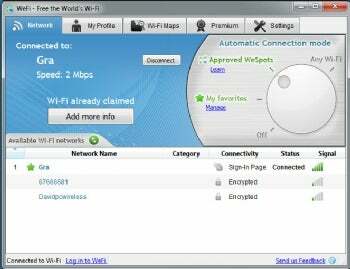 Freebie WeFi Does a Little More Than Windows Wi-Fi Features--But Is it Enough? WeFi is a simple, free program that helps you find Wi-Fi hot spots to which you want to connect. Install it, and it searches out nearby hot spots, showing you information about each, including whether it is encrypted or an open network, its signal strength, and what kind of category it's in--for example, a café. Once you see a hot spot you want to connect to, double-click it and you'll connect. WeFi helps you find hot spots and connect to them, but is only moderately more useful than the utility built into Windows. In addition, you can find hot spots at other locations. Click the Wi-Fi Maps tab, and enter a street address, and the program will show you a list of hot spots on a map. WeFi gets this information from WeFi users who have used the program and then had information about the hot spots they find sent to WeFi. This newest version, version 4, is significantly different from previous versions of the software. In previous versions, you were able to see nearby WeFi users, get information about them, and communicate with them. In this new version, that has been done away with. You can connect WeFi to your Facebook profile, but there's no apparent reason to do that, because no social networking related to Facebook--or any other type of social networking--is included in the program. The program can also manage how you connect to hot spots; for example, you can automatically connecting only to hot spots that you count as your favorites, or only to hot spots that have been discovered by WeFi members. All in all, WeFi is only a moderately useful program. Windows already has the ability to find Wi-Fi hot spots, and WeFi only adds a few new features, such as connecting to only certain hot spots automatically. Unless one of these features makes it a killer app for you, you might as well stick with what's already installed on your system.